First QE, and then ZIRP, and then a massive tax cut...aside from the kitchen sink, the government has thrown everything in their bubble-inflationary arsenal to keep this stock market rising. Actually, they put a tariff on the steel used to make that kitchen sink as well. It's late days in an unprecedented, fully engineered economic currency expansion that has rippled through every facet of the economy. It’s not hard to see that each bounce up has become weaker than the bounce before. What happens when the collapsing ceiling and the floor meet? If the market breaks through that floor, typically the floor collapses. From there, it now has a long way to fall without any obvious support. In my view, it’s a fall that eventually leads back to the bottom of the Great Recession and maybe even further. 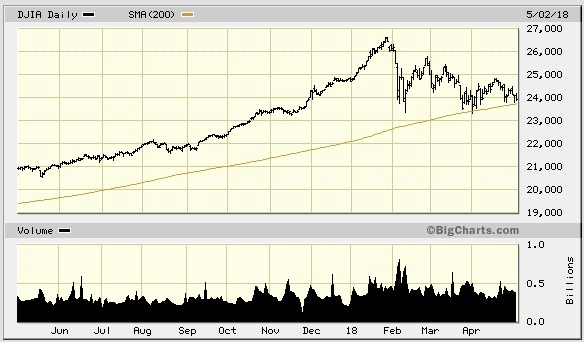 When stocks fall below their 200-day trend, the market is generally considered to have made a change in trend. So, we are now perfectly poised to see where this market is going from this point forward.